Image Sailing Energy. More at their Fb page. 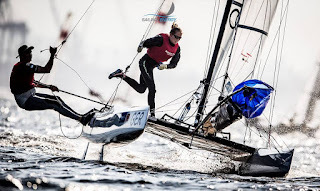 Paul Kohlhoff & Carolina Werner made their appearance in the Nacra 17 podium only at Kiel Week 2015, that event did not have the top riders racing with them but later and after a good Worlds at Denmark they managed to secure a spot for Germany for 2016 against the very best of the new Olympic Multi fleet. Now at Rio Test Event 2015 they are leading a small but super talented fleet by 8pts after 6 races. The fight for the Multihull Medals next year is going to be one of the most competitive in the Olynmpic sailing arena.